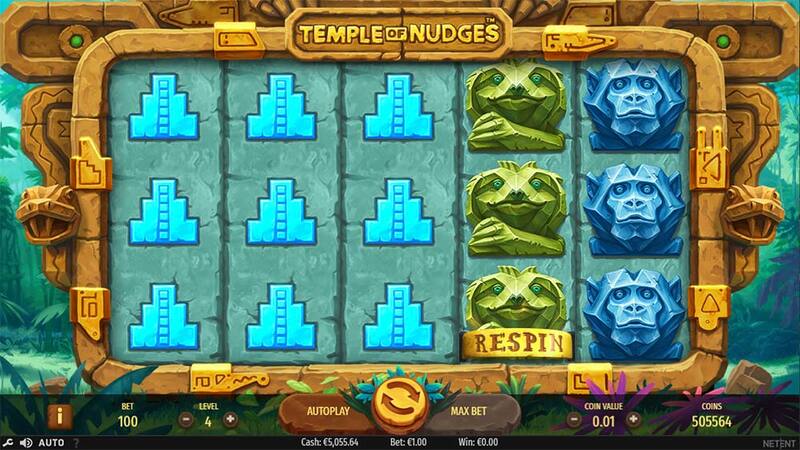 We Explore the Classic Slot Features in the New Temple of Nudges Slot From NetEnt! 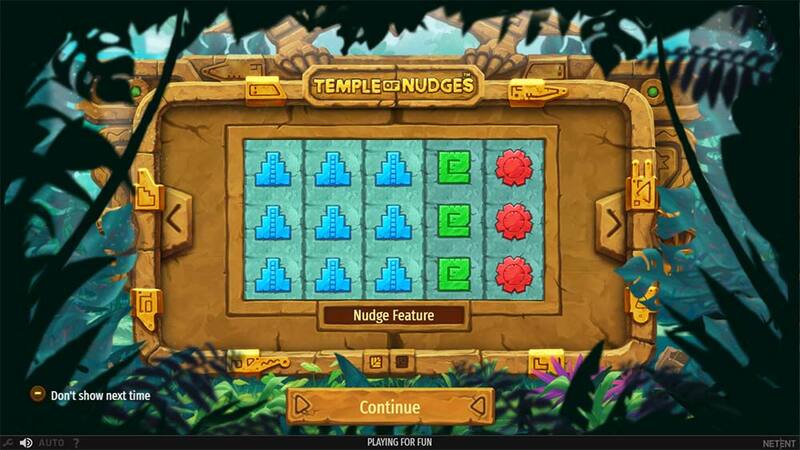 Energy Casino has recently added the latest NetEnt online slot Temple of Nudges to their casino. 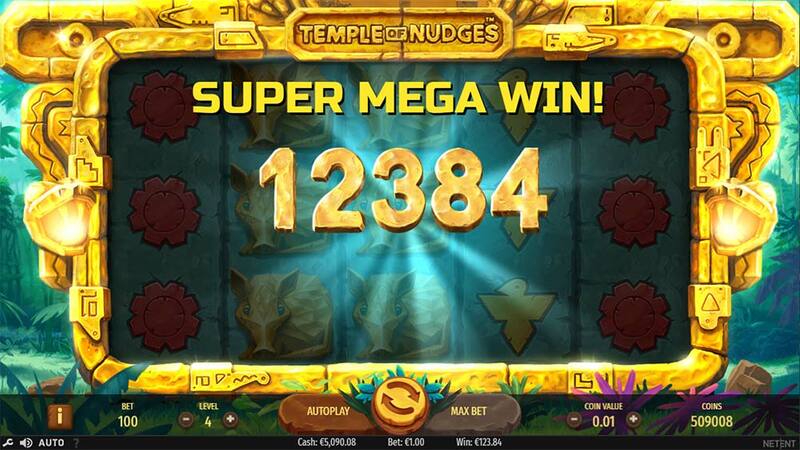 Temple of Nudges aims to combine some of the classic slot features that have stood the test of time such as Nudges and Hold/Re-Spins with the more modern pay any-way payline structure whilst doing away with any regular bonus round features. 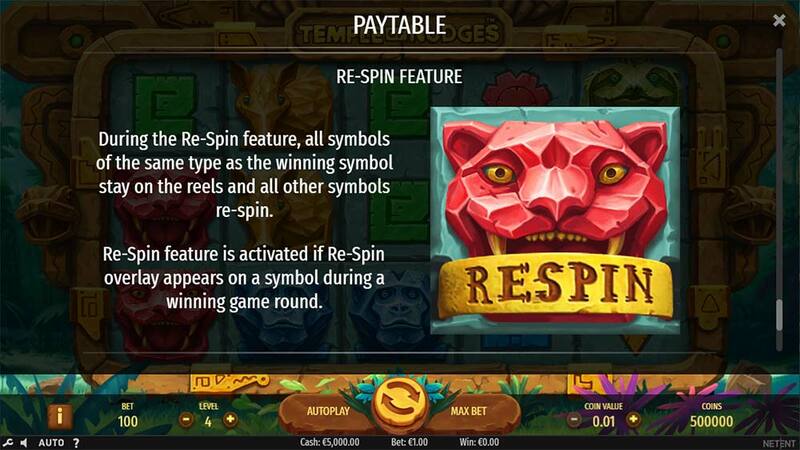 The reels are heavily stacked with a mixture of high and low paying symbols and this really is a key feature to this slot as it is not just the initial win from a regular spin to watch out for, but rather the nudging feature which kicks in after any win shifting the reels down into potentially many further wins. When the reels do land in a decent synced formation it’s quite possible to land many other consecutive wins and this is where the slot shines, to help things further NetEnt has added a Re-Spin feature which basically holds all of the winning symbols on the reels and re-spins the others giving you that extra chance of landing a bigger win and lining up the reels so that when they do nudge even more wins come in. With 243-ways and a medium variance, the base gameplay does play quite nicely with regular wins, re-spins and nudges, and whilst we generally do personally prefer slots with a main bonus round and some randomly activated special features, the nudging feature on this slot is realistically the bonus as full screens of symbols can keep nudging into view quickly turning into a decent win into a “Super Mega Win”. Every time a winning combination lands on the reels after the win is paid the reels will all nudge down by 1 position, if a new winning combination is in view then this nudging features continues until no new wins are visible on the reels. The Re-Spin feature activates when the special overlayed Re-Spin symbol lands in view on the reels during a winning combination (see screenshots above). All of the winning symbols are held in place and the reels will re-spin, any new matching symbols will then be held on the reels before the Nudging feature then activates. 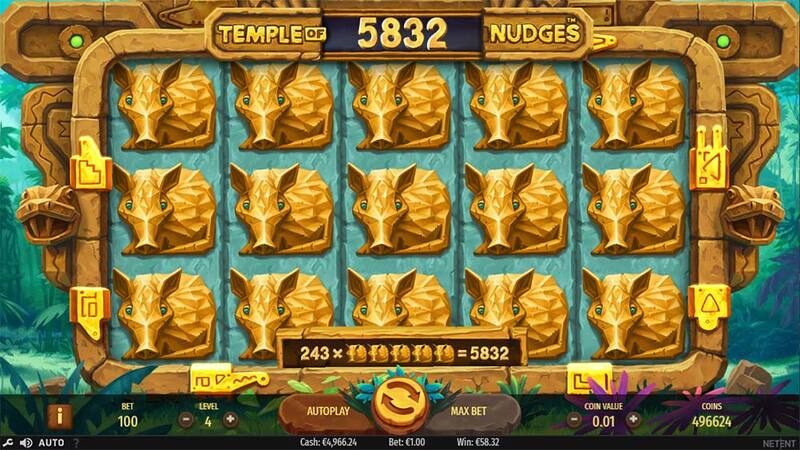 Temple of Nudges isn’t going to win an award for innovation that’s for sure, what you do have is a reasonably solid medium variance slot with simplistic gameplay that has some very decent win potential thanks to the nudging and re-spins feature. Whilst you do not have the growing anticipation from scatters teases and bonus triggers this slot will definitely spark your interest if a full screen of matching symbols drops in and nudges into even more. 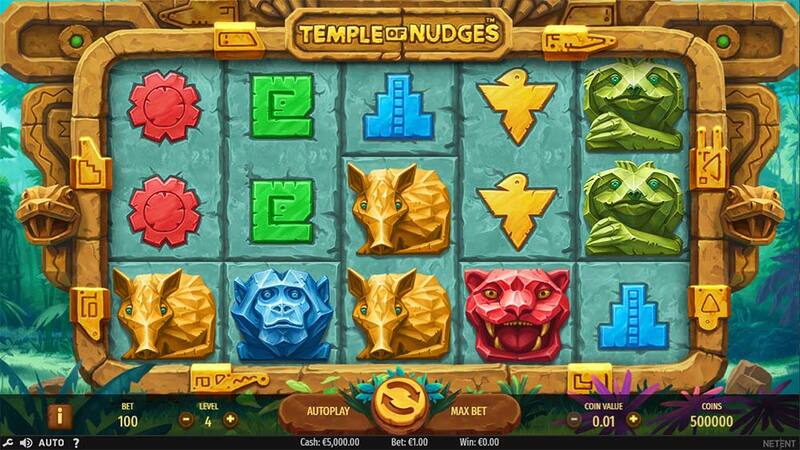 Overall, Temple of Nudges is worth checking out, not a slot I would spend too many spins on as the lack of a bonus round hurts its long terms appeal but its certainly capable of randomly dropping in 100x stake wins when it pleases giving you a decent exit point.